However, RT’s outputs are inconsistent about precisely who these corrupt elites are. For example, RT’s documentary Soft Occupation (2017) alleges that Germany has been under de facto occupation by the USA since World War Two, and that the US and its transnational delegates constitute a threat to the unity of the EU. In The Greek Depression: Hostage to Austerity (2016), however, the EU and its austerity programmes threaten the lives and democratic freedoms of ordinary Greek people. This opposition between ‘people’ and ‘elite’ can become overtly conspiratorial, such when the death of a US-critical journalist in Soft Occupation is reported as being “Officially… of a heart attack, but what caused it has yet to be specified” (24:41). 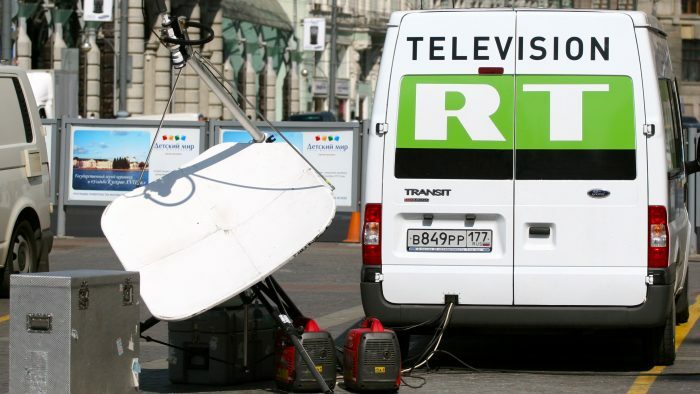 Another way in which RT creates immediacy of coverage is through the use of personally-involved commentators. Narrative voice is frequently delegated to these close witnesses using vox populi segments in news and current affairs programming, mobile phone recordings from eyewitnesses, plus formal interviews and informal home-made video diaries in extended programming. Similar patterns of affective immediacy are present with the network’s professional presenters. Reporters and moderators often disclose their own opinions, whilst documentary presenters more often than not have a direct personal connection to the topic that they are reporting. Audio-visual techniques further reinforce the ideas of crisis and immediacy: anchors explicitly highlight the magnitude of particular news developments; and recordings taken on hand-held personal recording devices are used even by its professional presenters. Precious N Chatterje-Doody is a Postdoctoral Research Associate at the University of Manchester, investigating the RT (Russia Today) network as part of the AHRC-funded project “Reframing Russia for the Global Mediasphere: from Cold War to ‘information war’?” In addition to her work on RT, she has research interests in historical narrative; national identity projection and political legitimation; Russian foreign and security policy; global media and ‘post-truth’ politics; and global governance. Precious tweets @PreciousChatD.